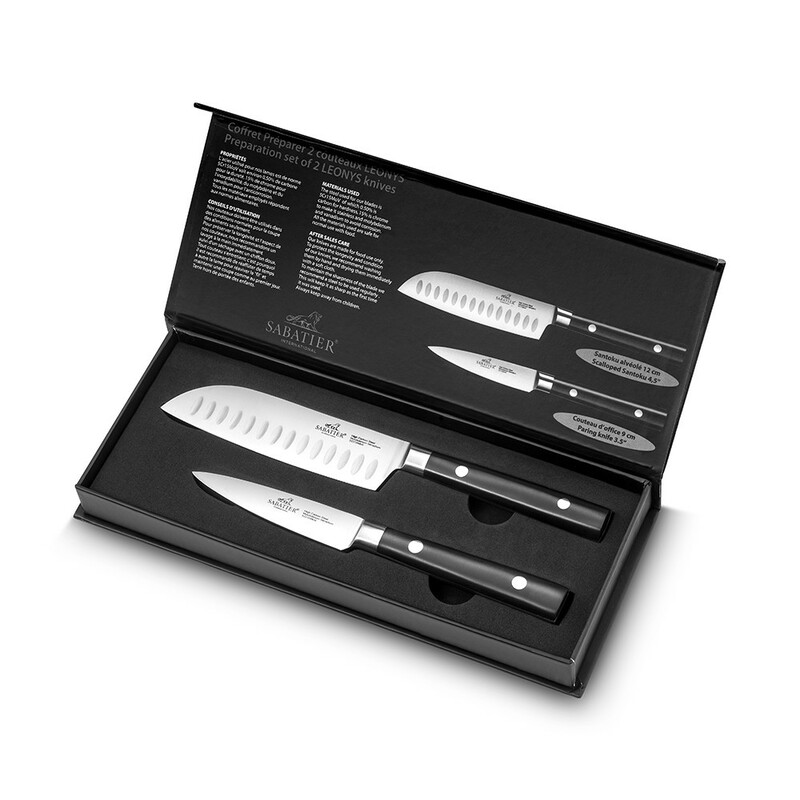 This Sabatier Leonys 2 piece knife set comes with a 9cm Paring Knife and a 20cm Cooks Knife. The first knife in the set is the Sabatier Leonys 9cm Paring knife is perfect for peeling, slicing and coring fruit. A good paring knife is a kitchen 'must have' and our multi-purpose 9cm Professional paring knife has a small blade ideal for peeling, slicing and coring fruit and vegetables, or even scoring skin on meat such as pork for delicious and crispy crackling. The second knife in the set is the Sabatier Leonys 12cm Mini Santoku knife which has a wide, hight quality blade making it perfect for slicing onions, fish or meat without worrying about the food sticking to the knife or scooping up ingredients to be placed in a pan or bowl.This set is part of the world renowned Sabatier International range. Manufactured to the exacting standards demanded by the Lion Sabatier factory in Thiers, France. Rousselon Dumas-Sabatier who have been manufacturing Sabatier knives since 1812 are one of the most famous and well known knife manufacturers in France. These high quality knives are perfect for use at home, are easy to handle and equally as easy to sharpen. Comfortable contoured handles shaped to fit with your hand perfectly. Made from 5Cr15MoV stainless steel with an official Rockwell Hardness rating (HRC) of 55/58. These knives have a strong, sharp cutting edge with double rivet handle and beautiful black finish thats contrasts perfectly with the steel of the blade. The Sabatier Leonys 2 piece knife set comes with a 9cm Paring Knife and a 12cm Mini Santoku Knife. 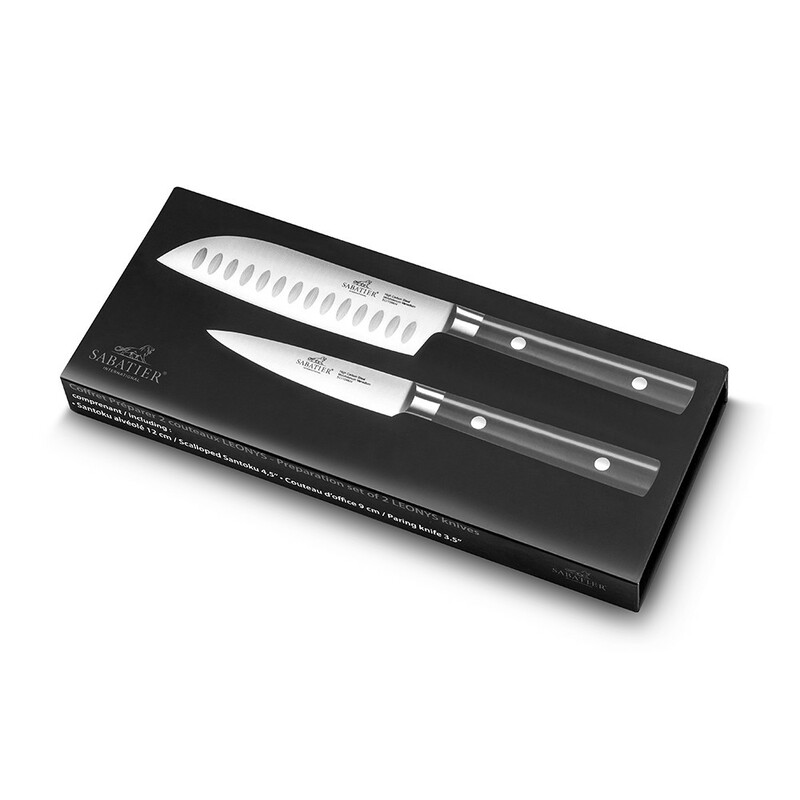 With their elegant black handle and stainless steel rivets this 2 piece set gives you two of the most commonly used knives at a fantastic price. These Sabatier Leonys knives will become the most frequently used knives in your kitchen as they are ideal for a multitude of tasks.